Generally, a blink of light emitted by a molecule does not ever return back. This theory has been altered now by a team of researchers who have found a way to place single molecules in an extremely tiny optical cavity that emitted light particles, or photons, return to the molecule before they have left properly. The energy swings back and forth between molecule and light, resulting in a full mix of the two. Former attempts to blend molecules with light have been complicated to create and were only possible at extremely low temperatures, but the researchers, supported by the University of Cambridge, have formulated a technique to generate these 'half-light' molecules at room temperature. These extraordinary interactions of molecules with light offer new methods to control the physical and chemical properties of matter, and could be applied to assist in the perception of intricate processes involved in photosynthesis, comprehend quantum data, or even control the chemical bonds between atoms. The research findings have been reported in the Nature journal. In order for single molecules to be used in this manner, the researchers had to construct sturdy cavities measuring just a billionth of a meter (one nanometer) in width so as to trap light. They utilized the minuscule gap between a mirror and a gold nanoparticle, and placed a colored dye molecule inside. It's like a hall of mirrors for a molecule, only spaced a hundred thousand times thinner than a human hair. To attain the molecule-light mixing, the dye molecules had to be appropriately positioned in the tiny gap. "Our molecules like to lie down flat on the gold, and it was really hard to persuade them to stand up straight," said Rohit Chikkaraddy, lead author of the study. 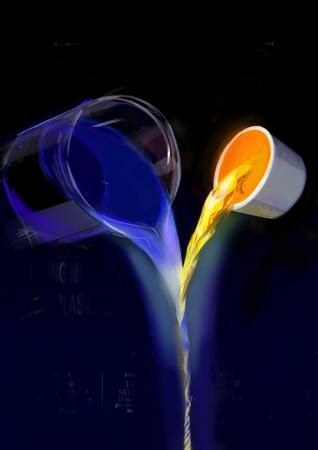 To resolve this, the researchers collaborated with a team of chemists at Cambridge headed by Professor Oren Scherman to enclose the dyes in hollow barrel-shaped molecular cages referred to as cucurbiturils, which can maintain the dye molecules in the preferred upright position. When put together accurately, the molecule scattering spectrum divides into two isolated quantum states which is the indicator of this blending. This spacing in color matches photons taking less than a trillionth of a second to return the molecule. An important development was to demonstrate that strong blending of light and matter can be achieved for single molecules even with large absorption of light at room temperature and in the metal. Finding single-molecule signatures took months of data collection. The team was also able to monitor steps in the color spacing of the states corresponding to whether one, two, or three molecules were in the gap. The Cambridge team partnered with theorists Professor Ortwin Hess at the Blackett Laboratory, Imperial College London and Dr Edina Rosta at Kings College London to comprehend the interaction and confinement of light in such minuscule gaps, matching experiments astonishingly well. The research received funding as part of a UK Engineering and Physical Sciences Research Council (EPSRC) investment in the Cambridge NanoPhotonics Centre, as well as the European Research Council (ERC), the Winton Programme for the Physics of Sustainability and St John’s College.